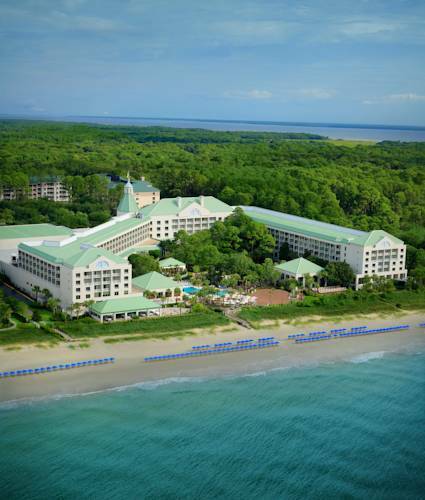 The Westin Hilton Head Island is beautifully situated amid lush gardens along a stretch of sandy-white beaches. Delight in the ocean breeze, watch the day go by from a poolside lounger, or take time out for yourself at our Heavenly Spa by Westin .After a $30 million complete renewal, our oceanfront resort exudes a soothing coastal style. Walk out to 12 miles of pristine beach, relax around three swimming pools, play golf and tennis, or soak up the unspoiled beauty of the South Carolina coast.Unwind and renew as you admire the islands natural surroundings from your private balcony. Each guest room or suite features the Heavenly Bed, the Heavenly Bath, a mini-fridge, High Speed Internet Access, a flat screen TV, and stylish coastal d cor. Splash: Enjoy casual dining and cold drinks with picturesque ocean views at our poolside bar and grill. Located next to our main pool and steps from the beach, Splash offers a relaxing place to listen to live music and relax in the warm ocean breeze. The Carolina Room: The Carolina Room s farm- and sea-to-table menu features the freshest seafood, meats, and produce sourced locally. Infused with a Lowcountry twist, modern cuisine is complemented by an extensive wine list and craft cocktails. ingredients: Let ingredients kick-start your day with your favorite morning drink. Come back any time for a healthy SuperFoodsRx snack or frozen treat. From wraps and salads to frozen yogurt and fruit cups, you ll find something perfect to hold you over. View 32: This exciting restaurant and bar is the perfect place to cool off with a frozen, 32-degree drink, or simply take in panoramic views of the magnificent Atlantic Ocean at the 32nd parallel. The largest barrier island between New Jersey and Florida, with 12 miles of breathtaking Atlantic beachfront, Hilton Head Island is located on the Intra-coastal Waterway and encompasses vast sea marshes, creeks and lagoons, and moss-draped forests of live oaks, magnolias, pines and palmettos. Wildlife preserves make the island home to hundreds of species of birds and animals, including the familiar alligator.With its trademark striped lighthouse, world-class golfing, top-ranked tennis facilities and magical marinas it's no wonder why Hilton Head Island is the ideal place to retreat and reinvigorate. Practically any water sport imaginable is available, along with great outlet and boutique shopping and award-winning restaurants for countless ways to plan your getaway.